Chic at the front, grunge at the back and a touch of color thanks to the shoes. It's a DIY t-shirt so basically I bought a simple top and cut a skull head at the back. What do you think? Chic devant, grunge derrière et une touche colorée grâce aux chaussures. C'est un t-shirt "DIY", en fait j'ai acheté un t-shirt tout simple et j'ai coupé une tête de mort dans le dos. Qu'en pensez-vous? 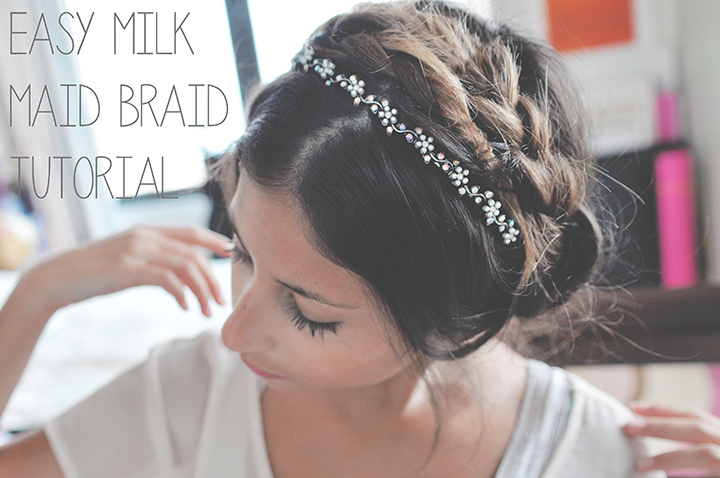 As it has been requested in my previous post, here is a Milk Maid Braid hair tutorial so you guys know how I create this hairstyle. It's super easy, lovely, and perfect for summer! I tried to make a video tutorial so it's easier to understand because I know how boring and not understandable it is to read a whole article on how to do a hairstyle. So I hope you like this video and let me know if you want me to do more videos like this... ? Comme ça été demandé dans mon article précédent, voici le tuto vidéo pour vous montrer et expliquer comment je réalise cette coiffure. C'est super facile, joli, et parfait pour l'été! J'ai fait de mon mieux pour monter une vidéo de façon à ce que ce soit plus simple à comprendre car je sais à quel point ça peut être ennuyeux et incomprehensible de lire des paragraphes entiers sur comment faire une coiffure. Donc j'espère que vous aimez cette vidéo et si vous souhaitez que je fasse plus souvent des vidéos de ce genre, faites le moi savoir svp! love this outfit & hairstyle, btw its shen! new blog, follow me pretty, miss you! Thank you Sammie! It was quite easy to do, you should definitely try! Let me know if you have any question on this "DIY"
Amazing :) This video is really helpful. Could you do similar tutorial on every day make up? Cause you always look so flawless :) I am wondering how you manage to do that. I'm glad to know that you liked it and it makes me want to do more videos. Of course, I'll try to do one on my everyday makeup even though the truth is that I don't wear a lot of makeup! haha. It has to happen indeed, I'll probably be able to have a sale in September, as soon as I get back to London! :) Hope this helped. Hi dear, thank you so much for your comment, it makes me want to improve my blog and now I know that some people actually enjoy reading it (something that I wasn't sure about before). I'll definitely follow your advices as they help me so much to know what really interests my readers. I thought about giving tips indeed, but I'm even more motivated now thanks to amazing readers like you. It really builds my self-confidence in regards to my blog and writing. Especially regarding videos as it's not supposed to be my field, so I'll do my best to keep doing those as I realized that you guys like them! Hi Luna, happy to hear you'll be following my advice. As I said before, keep writing and posting articles, they help loads of people, I must admit I use some of your tips for my outfits... I also wanted to tell you that I know someone you know as well! Her name is Leela Baron! She's a friend of mine and she's actually the one who recommended this blog, I think she's a huge fan of yours and always tell me you're her role model! Anyways... Talk to you soon! I'm in shick with the t-shirt!! Amazing! Fabolous!! I fall in love with it!! !